Ancient Maya Wooden Buildings Discovered Below the Sea Floor! Check out Underwater Site 74! Here you see the team on Research Flotation Devices (RFDs), searching underwater for wooden posts that formed the outlines of rectangular buildings used in the ancient Maya salt industry. In this web site, my team of students, collaborators, and I tell the story of the discovery, mapping, and study of the Paynes Creek Salt Works--where the coastal Maya of southern Belize produced massive quantities of salt for the inland Maya at nearby Classic period cities, between about A.D. 300 and 900. My previous research indicated that sea-level rise had submerged Maya sites in the coastal area, including 3 salt works in a shallow, salt-water lagoon. While searching for more submerged salt works in the lagoon in 2004, there was an unexpected discovery: We found wooden posts barely protruding from the sea floor! Wood normally decays in the tropical landscape of Central America, so the finds were surprising. Stone temples and palaces have preserved at Classic Maya sites. Most buildings at ancient Maya sites were likely perishable structures of wooden poles with palm-thatched roofs, like in traditional Maya villages today. Underwater Maya Project Who Am I? You can't see the buildings from above the water because they are buried below the sea floor. They were preserved in red mangrove (Rhizophora mangle) peat, a highly-organic sediment that lacks oxygen, so the wood preserved perfectly! The underwater sites were hidden from modern view until our underwater search in 2004. Here you see LSU Archaeology students snorkeling on RFDs (Research Flotation Devices) locating and marking the locations of wooden posts with survey flags that extend above the water. Post numbers are marked on the flags. All field research was carried out under permits from the Belize government Institute of Archaeology. The 2004 survey that included the discovery of the wooden architecture was funded by a Faculty Research Grant from Louisiana State University. Underwater survey and mapping from 2005 to 2009 was funded by grants to me from the National Science Foundation, National Geographic Society, and FAMSI--Foundation for the Advancement of Mesoamerican Studies, as well as Robert C. West Graduate Student Field Grants (LSU Dept. of Geography & Anthropology) to Cory Sills, Bretton Somers, and Mike Mirobelli. a lecture from an underwater site! the Lagoon Lab! Here you see former LSU grad student Bretton Somers with the total station survey instrument at one of our permanent datum markers. 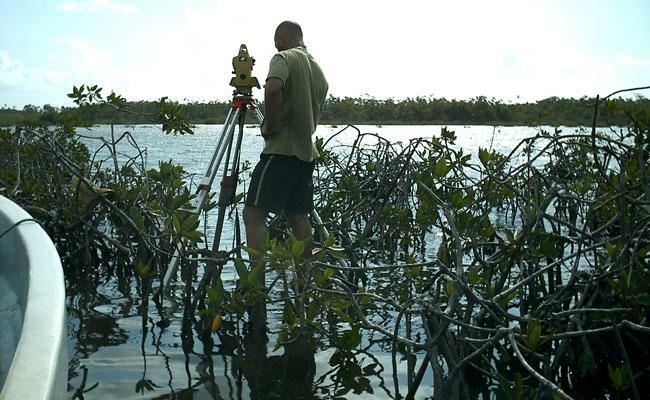 We had to find stable ground for the survey instrument to level and take accurate measurements--not an easy task in a mangrove landscape. Thousands of wooden posts were mapped using a total station survey instrument! We mapped the exact location of each wooden post and then transferred the digital data to a laptop in the evening at our jungle camp. Although the survey flags marking post locations gave an indication of the size and shape of structures, the GIS maps were precise records of the buried structures. The data were loaded into the project GIS (Geographic Information System) to create maps of the underwater sites. We also flagged the locations of selected artifacts that were stylistically typical of specific times or activities. Briquetage--pots used to evaporate brine over fies to make salt--was everywhere! Total Station Mapping flotation survey! Wood Decays; 3D Scans are Forever! Waterlogged wood and salt-saturated pottery from the Paynes Creek Salt Works decay on exposure to the air, so we keep them in bags of water until the finds can be studied at our base camp or at a temporary "Lagoon Lab" set up near an underwater site. Selected artifacts are 3D imaged at our base camp and then cached in GPS-marked locations in deep silt in the lagoon where they are preserved for the future. Here you see a movie of a 3D scan of part of a wooden building post, that highlights the sharpened end of the post that was in the ground.